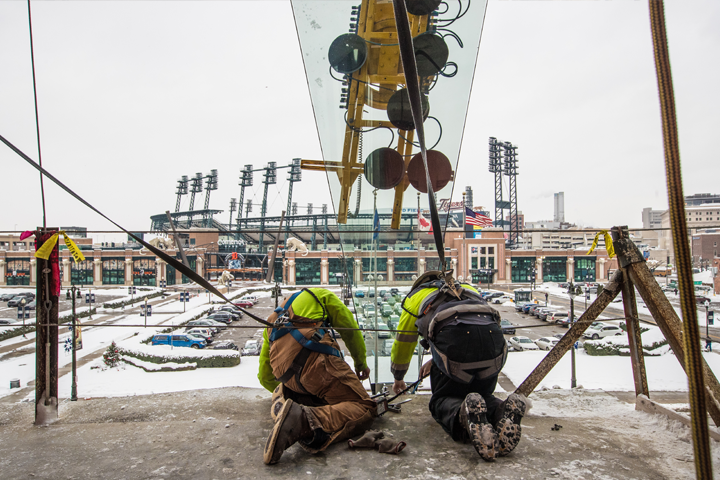 To date, more than $56 million in contracts have been awarded to Detroit-based businesses for construction work on the building. That figure represents nearly 70 percent of the total contracts awarded for the project so far. Further, almost all contracts, 99 percent, have been awarded to Michigan-based businesses. Located in the heart of The District Detroit’s Columbia Street neighborhood, the $150 million, 9-story, 235,000-square-foot building will become the new home of 700 Little Caesars Enterprises, Inc. colleagues. National Enclosure Company (NEC), a Michigan-based company, will install the east façade made up of 102 pieces of triangular pizza slice-shaped, folded glass. Each piece stands 14-feet tall and weighs nearly 1,000 pounds. Set to open in 2018, the headquarters will empower the company employees, franchisees and suppliers and will feature modern amenities, such as collaborative workspaces, a fitness center and street-level retail and eateries. Detroit-based businesses, Brinker-Christman and architectural firm SmithGroupJJR, are providing leadership on the project.